It’s a Girl Thing! This contemporary monthly celebration of Moving Traditions is a celebration of the ancient New Moon holiday. For girls in grades 8-12. Builds self-esteem, leadership skills, Jewish identity and great friendships. Sundays: January 21, February 11, March 11, April 15, May 6 • 4–5:30 pm. At the synagogue. 4 pm–5:30 pm. Location to be determined at individual homes. Meet once a month on Shabbat mornings for an engaging Youth Study & Kiddush lunch. Saturday Kiddush Lunch Dates: Jan 20, Feb 24, March 3, April 28 • 12:15-1:15 pm. Social group for 7th and 8th graders that meets monthly on Sunday afternoons. Join us for fun social events, retreats and community projects! Adath USY is a Jewish Youth Group within the international USY organization. USY is a fun way for Jewish teens, from 9th-12th grade, to form friendships, learn more about their religion and culture, and become leaders in their community. To join us at Regional and International events, you must be a member of Adath USY. Send the kids to "camp" and enjoy a night out! Drop your kids off at Adath in the foyer for an engaging, interactive, fun, "camp-like" childcare night coordinated and run by Adath USY & KADIMA (7-12th Grade). Adult supervision, too! Fees: $15/child up to two kids-other kids in your family free! Tenth graders meet weekly with the Rabbis to study and engage in meaningful dialogue. Contact Darlene, Rabbi Weininger's Assistant. High School Community Education Program. Visit their website. 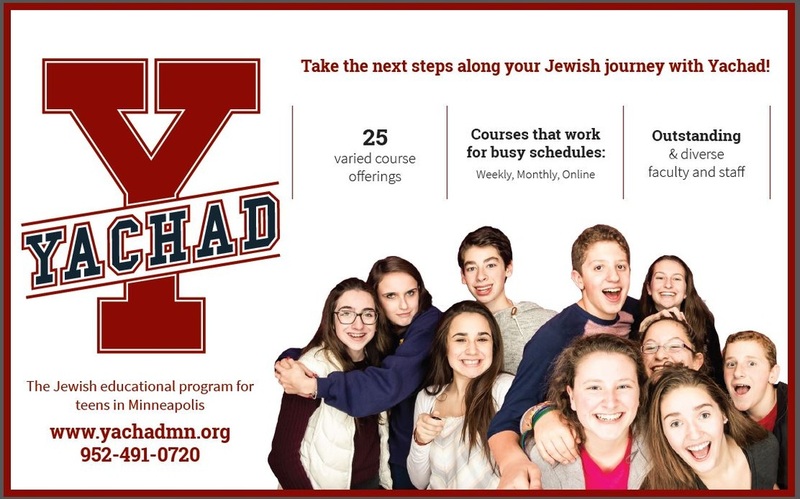 ​Yachad offers kids in grades 9-12 a personalized approach to learning that empowers teens to embrace accountability for their own Jewish education and provides them with the new skills and context necessary for success. When a child comes of age it is a simcha for the immediate family, the synagogue family, and the entire Jewish community. Visit our Life-Cycle Events page to learn more or read the B'nai Mitzvah Guide. SMP is the cornerstone of educating our young congregants. All children entering 5th Grade and above who plan to celebrate a Bar/Bat Mitzvah at Adath Jeshurun are required to attend the program for 5th–7th Graders. 8th Graders: This program starts students on the road to becoming SMP staff. The curriculum includes Ethics - emphasizing the Ethics of Speech, "Shmirat Lashon," leadership skills and tzedakah that inform their role as mentors of younger students; and a review of their prayer and Torah skills. 9-12th Graders: It is a proud Adath tradition for teens to serve as SMP staff. This vital role engages these teens in Jewish life and teaches them responsibility, and the value of passing on our traditions. Service-based scholarships for Jewish summer camps and Israel trips are available to teens who serve as SMP staff. Contact Risa to learn more.